I have had a lot of luck and FUN at the local thrift stores this week! After I accomplish my writing goals and before I start in on my sewing, I take a break at my usual thrifty haunts. This week I couldn't have been happier at what I found! Take a look at my thrift SCORE! 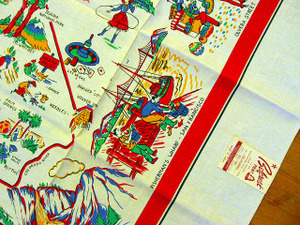 I spotted this vintage souvenir tablecloth hanging amongst other tablecloths from across the aisle. I practically sprinted to it! I collect tablecloths and have a few of these delightful kitschy souvenir cloths, but not as in pristine condition as this one! It has never been used and still has its original tag. I don't think I'll use it either. I can't bear to get it dirty or stained! At another thrift shop next to my local post office, I happened to step into their half-off Easter sale! 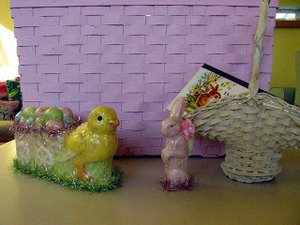 I found these wonderful glitter covered pieces: a chick pulling a cart of pastel eggs AND a soft pink bunny with a sweet flower basket on his back! I also picked up this small basket in wonderful white! The vintage postcard booklet has the sweetest forest critters! Perfect for thank you notes to my wonderful eBay customers! In the background you'll see another thrift find. A Simply Shabby Chic pink wicker basket! Today was my lucky day! OK, enough boasting for now! Have a wonderful spring and enjoy the beautiful blooms! 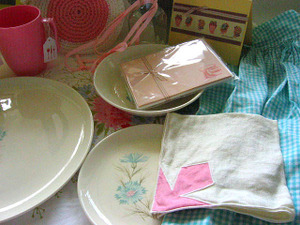 Vintage Kitchen Swap Goodies Came Today! 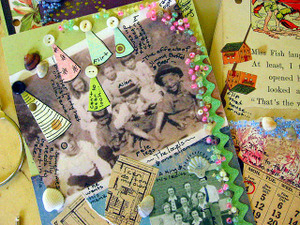 Hosted by the effervescent Jenny at Everyday Is A Holiday (see my sidebar to link to Jenny's web journal), I participated in a vintage kitchen swap! My swap partner is the wonderful Julie of Jane's Apron (see her on my sidebar too--you'll love her retro whimsical style as much as I do!). Today I received an adorable box of goodies from Miss Julie and I couldn't be more thrilled! Harking to a soft palette of aqua, pink, and yellow, Julie used her practiced eye to assemble a delightful array of fun and very useful items that I will cherish! 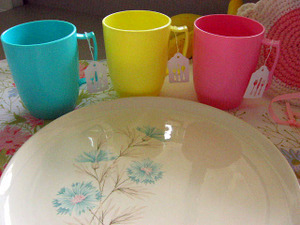 How could she know that I LOVE the vintage cornflower design on the plate, desert plate, and bowl? I do! In fact I have a platter of the same design! 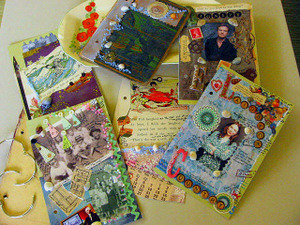 Julie genrously treated me to a pack of her very pretty notecards too! I will use the pastel cups not for drinnking but for storage in my office--vintage millinery flower stems will look right at home in them! And the glass oil dropper bottle will house some mica glitter perfect for sprinkling on my altered art collages! 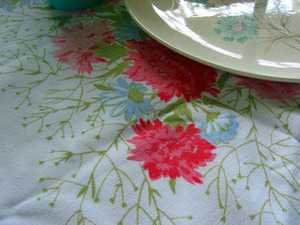 Julie included a tablecloth of the sweetest pastel wildflowers which will look lovely this spring! 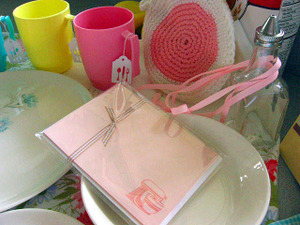 The sweet pot holder in pink and yellow reminds me of a beret! And the cutie pie aqua gingham apron will come in very handy! I can't thank Julie enough for such a wonderful experience in my first swap! I am eagerly awaiting another! Be sure to check out Julie's blog and her etsy site at Jane's Apron! Before I start a new book I need inspiration. I usually have a vague idea of the characters and the setting, but little else. 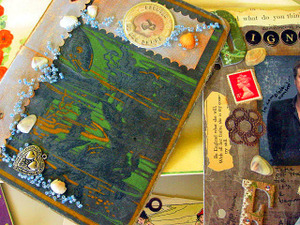 I jump start my creative process with creating a book collage or altered book. These creations are full of images and objects that call to me begging to be put together. I usually do a page for each main character, and since I write romance the main characters are a hero and a heroine. Then I reserve a page for secondary characters, one for setting, and one for plot elements. It's all loose and intuitive. If I don't feel an image fits I don't include it. Sometimes I journal on the pages with phrases and words that seem to fit. When I sit down to write my book I have my collage nearby for inspiration. It's a fun and crafty way to begin a new story adventure! I have taken a photo of my altered book disassembled and one of it assembled. I used large rings because the pages have dimension and I needed something wide enough to flip the pages. For the second year in a row I'm presenting my program "Deep Inspiration Through Collaging" at the Washington Romance Writers annual retreat this April. Last year there was a wonderful turn out for my workshop. One of our speakers, bestselling author Carly Phillips attended announcing that she collages before writing her books too! So does Susan Wiggs and Jennifer Crusie! The cover of my collage (and the back cover too) is from an old book that was beyond saving. It was begging me to give it a new life! The under the sea picture on the cover worked very well because my new book takes place in a coastal town. 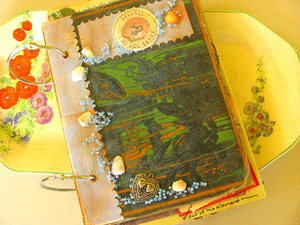 For embellishments I used charms, shells, and glass beads (which looked like bubbling surf to me). The placement of objects and images makes sense to me but is supposed to look random. I don't suggest thinking too much about placement. Let that be intuitive and see what it summons from your unconscious. Your book will start to come alive! I always rise on weekdays (and most weekends too!) at 5:30 a.m. Yes, I'm one of those annoying morning people. I love having the early pre-dawn to myself when the house is quiet and the only thing stirring is our cat who follows me everywhere. My boyz (husband and pre-teen son) love my cakes and love the idea of having a lush layer cake sitting on the counter waiting for them. Both asked me this morning when they came into the kitchen to the scent of baking cake if the cake was for breakfast. Alas, no. But I know they'll start in on it after dinner tonight. So, here is a picture of my Early Morning Cake which is quite simply a boxed vanilla cake mix the recipe altered with Egg Beaters instead of the real thing and some extra vanilla added with a little lemon extract for an unexpected kick. 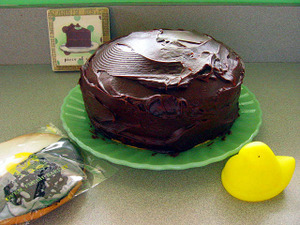 The rich chocolate icing comes from a can. One day I'll make my own! The black and white cookie is from one of my favorite bakeries owned by a lovely Vietnamese family. Their peanut cream cakes are to die for! 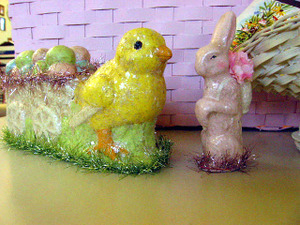 I love the little yellow Peep which I bought at a dollar store--It lights up and flashes! Notice one of Jenny's Bakeshop art works in the background! Check out her blog by clicking Under my Favorite Diversions on Everyday Is A Holiday! Here are more dollar store Peeps that have scented bubbles and two are ring pops! 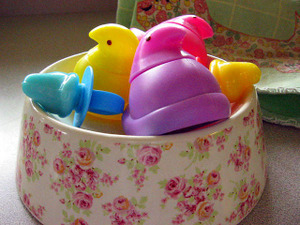 The Peeps are sitting in a Simply Shabby pet bowl which I couldn't bear to use for my pets! A special THANK YOU to Julie of Jane's Apron (see her blog by clicking the link under my Favorite Diversions) who told me how to make my pictures bigger so you wouldn't have to click on the thumbnails. 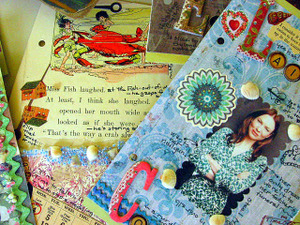 I've been working on a visual inspiration collage for my new book and will share it with you in my next post! After my morning writing time and creating a new tote for eBay today, I just couldn't stand it and had to venture out into SPRING! I couldn't believe that I actually needed some fabric in a specific style and color for a future project, but it was true. I decided to drive over to VIenna to Hancock's fabric store that is going out of business. I found what I was looking for and then inquired if there were any thrift stores in the town. You would've thought I would know that already, but I have such a tight little circle of regular shops that it rarely occurs to me to seek other enviorns. And...eureka! There is a small litte strip on the main drag which hosts several tiny second-hand/antique shops. Look what I found! A chalkware dog to add to my collection--now I have three! A metal flower hook for my sewing/writing studio. 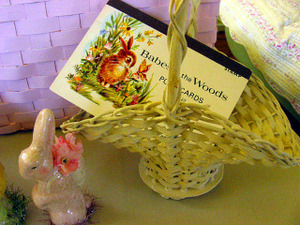 A sweet little wooden basket for Easter. A tiny bunny to be repurposed into one of my one-of-a-kind pin cushions for eBay...and a little horse too! 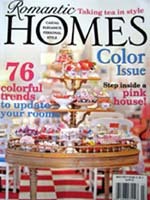 My favorite score is the soft pink tablecloth with white swirls and daisies all over! I found the sunny yellow sewing basket at a hospital charity shop in my neighborhood but thought you'd like to see it. And I wanted to show you the metal Wrights Vintage-Inpsired box I bought at Wal-Mart of all places! I just adore the retro look with ladies and girls from the early 60's strolling around the box. Yesterday I added a vintage birdhouse to my collection! I bought it on ebay from a wonderful seller in the upper Midwest. It's so sweet that I can't bare to set it outside in the weather. My husband calls it the "Dr. Suess" birdhouse. I love the rectangular bird door and the crooked lamp post! It was cloudy and very un-springlike today, but yesterday I did manage to take picture of the one and only bloom in our yard. We have a few daffodils ready to bloom but with the cooler temperatures we've been having, I don't blame them one bit for hiding their sunny glory until balmier days! In anticipation of wamer days, and I understand we'll be in the 70's this weekend, my husband made me a bird house. This is part one of what I plan to be a three-bird house condo to be placed in our front yard. I painted this charmer the brightest colors I could find in spray paint! I cut circles from painter's tape and placed them over the white base coat and them sprayed the house pink. Then after it was dry, I masked the house with paper and tape and sprayed the roof an atomic bright yellow! Until the other houses are complete, I'll keep this pink and yellow house on our deck next to my cheerful vintage garden bird! I love my kitchen! I'm not the best cook in the world but I do have my culinary passions: baking and making breakfast~~I do it most mornings for my husband and son. I wanted my kitchen to reflect the homey, nostalgic atmosphere of my grandmother's kitchen. When I was little and would spend the weekend with here, I would awaken upstairs in my mother's old big fluffy bed to the aroma of bacon, eggs, and coffee. I would pad down the dark waxed creaking steps onto the cool linoleum of her kitchen. My grandmother would be hovering over the stove cooking more food than a ten-year-old could possibly eat. I usually selected toast, bacon, and cereal~~~She would buy Coco Crispies for me and serve them in a jadeware bowl. I also drank from a plastic blue Popeye straw cup with a winking eye (Popeye has lost his eye but he holds a special place in my kitchen~~you can see the pale blue cup on the green counter.) My grandmother's kitchen was large, white and full of Fire King Jadeite dishes in a huge glass front cupboard. My kitchen is a smaller version of that comfortable color scheme. After we had it remodled I hung a picture my grandmother received as a wedding gift back in the 1930's~~~The poem is so PI now, but I think it's sweet. I adore jadeite green. In fact, I adore green in most forms. On my white cabinets I installed reproduction jadeite green glass knobs and handles. My husband made a counter and painted it green. There is green everywhere. One day I will change out the white linoleoum floors as they show too much dirt. I sweep twice a day! One one wall you will see prints decopaged on panels from the talented Jenny from EverydayIsAHoliday on eBay. I love these lush cake prints from Jenny's orginal art and they inspire me to make cakes~~layer cakes!~~for my family. We also have lots of collections including chalkware fruits and lots of cool advertising memerobilia of food and restaurants. Our kitchen is fun, cozy and welcoming. And best of all it's GREEN! Our Australian Cattle Dog, Sheila, likes the kitchen too! It has her dog bec and her food bowl. She has to share her water bowl with Gyro, our big kitty! Thanks for visiting our kitchen! OK, I admit it freely. I'm a fabricaholic and not looking for a cure. I began collecting fabric when I inherited my wonderful late Grandmother's sewing table, all of her trims, and all of her fabrics. My Grandmother saved everything. She saved every curtain in her house and pillowcase. She made them all! I just knew I had to something with these wonderful vintage fabrics to honor her sewing talent and to hone my sewing skills. I decided to make something useful that my family and friends could use. Totebags! I am inspired by the fabrics from Grandmother's house. She loved soft colors, faded and inviting. Pink was her favorite, but she also welcomed aqua into the mix. I welcomed the soft palette of summer afternoons and warms days on her front porch coloring in my coloring books and drinking sweet tea. Her large, oddly-shaped sugar cookines, slightly burnt on the edges, but made from scratch were the perfect compliment! Every tote I have made, I silently dedicate to her. 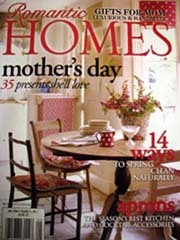 She was the ultimate recycler and would be thrilled to know how I have used her fabrics! I have carefully built a collection of vintage fabrics which reflect the era of my Grandmother's prime. Big lush flowers display their blooms unashamedly on fields of slate grey, buttery yellow, pale blue, soft ecru, and jadeite green. It's a special garden that calls to all of us a sense of nostagia when it was just fine to swing lazily back and forth on a summer day with the cicadas buzzing hidden among the trees. And...if you would like to see what I offer on eBay each week, please visit seller: Bethsbagz! Today I learned how to use Photoshop and a digital camera. I am very proud of myself for overcoming my fear of using a camera that doesn't require film. I have finally stepped into the 21st century! Welcome to my first blog entry. I am a writer and a crafter. 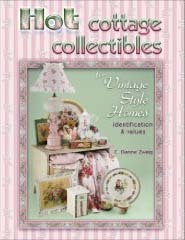 I have published one book and have sold over 800 one-of-a-kind totes and over 300 pin cushions on eBay. What inspired all of this? I have posted a picture below of my very first coloring book--yes, my mother pretty much saved everything...and then she gave it to me! I am inspired by the kitsch of dime-store design. If you have every visited a Woolworths you know what I mean. I will post much more (my goal is to post every day), but for now this is a test to see if I can actually post on a weblog. Come on back! I promise I'll make more sense of my creative, whisical, crafty, writerty life. Join in. The water's fine!